These are all available as chart pack booklets. 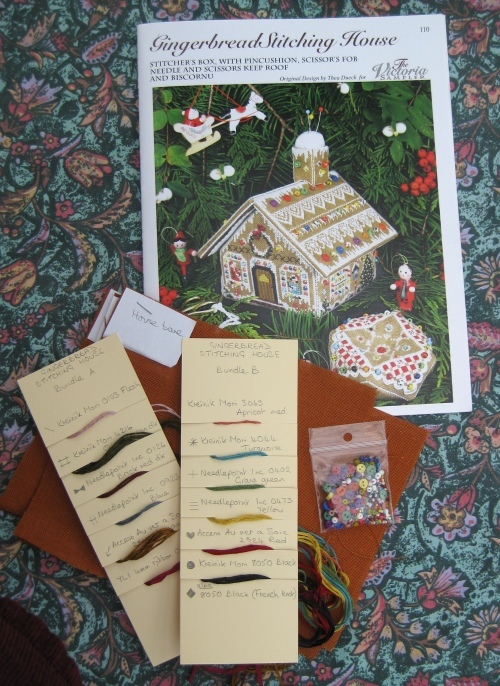 I’ve made the Gingerbread Stitching House etui (on the far left of the picture), and now I’m making the Candy Cane Cottage (in the centre). I’ve got the chart booklets for the tree and the church in my stash. But now what has Thea done?! While I wasn’t looking, she has added several more items to the village, and I’m just going to have to get them! Well, most of them. See below…….. 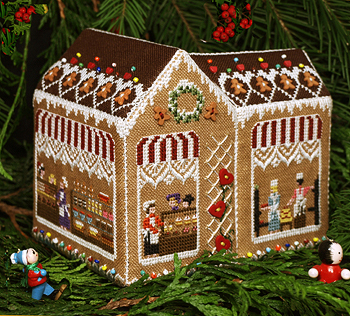 The first one which grabbed my attention was the Gingerbread Needlework Shop. This is made up as a box, with a lid that comes off so that you can store stitchy things inside. 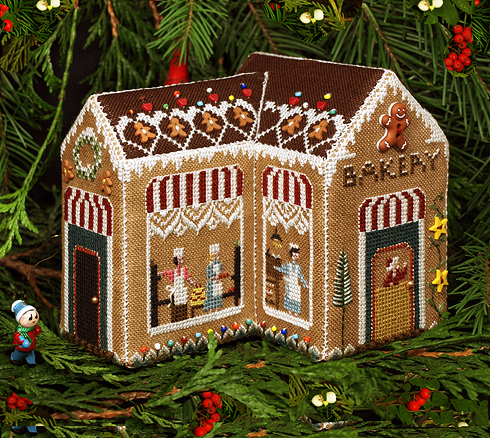 Then there’s the Gingerbread Bakery. 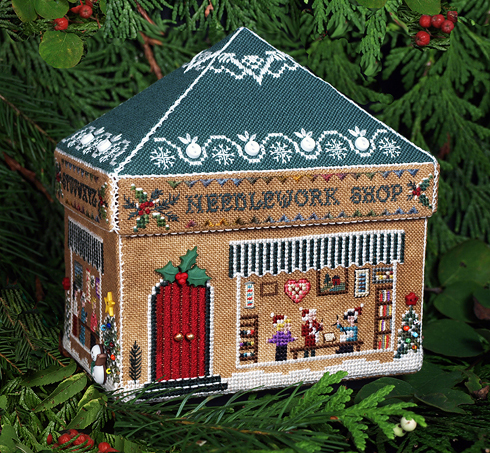 This is an interesting shape, and I’m not sure if I want to make this one next after the Candy Cane Cottage, or the Needlework Shop. Both look really nice. Then there’s THIS. A ‘Retreat Cottage’. 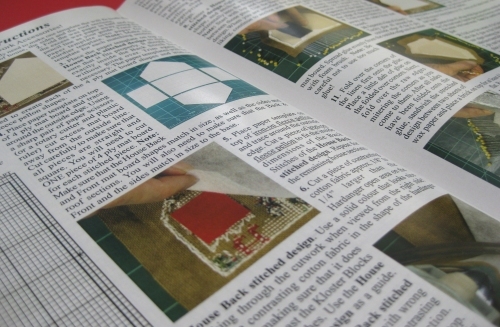 At the moment, it’s only available if you go on a stitching retreat with Thea, but it should be released as a chart booklet next year (2016), apparently. I love the look of this one. 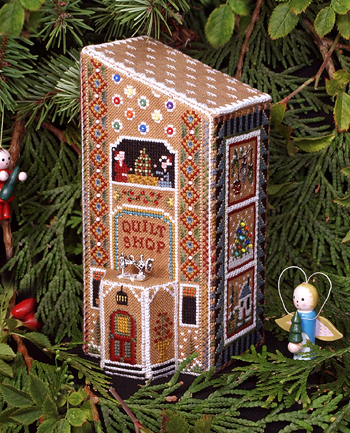 There is also this Gingerbread Quilt Shop. I’m undecided about this one at the moment. It’s the latest one to come out (autumn 2015). I love the patterns on the building, but I think that the building itself is rather ugly. Maybe I could adapt the design to make the roof more ‘normal looking’, somehow? I’ll have to think about it. But then there’s also THIS. Not sure about this one at all. OK- it’s a building, but it’s a Halloween building, and I don’t feel that it sits well with the rest of the Gingerbread Village buildings in the slightest. As a project in its own right it would be great. I know that Halloween-themed things are very popular in the US, but I’m English and they leave me cold, so I won’t be buying this one. 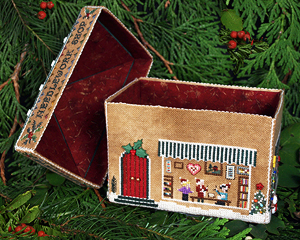 So, finally, here is a view of all of the Gingerbread Village buildings in Thea’s range so far – this image is the header for the Victoria Sampler Facebook page. Don’t these all look wonderful as a group together? 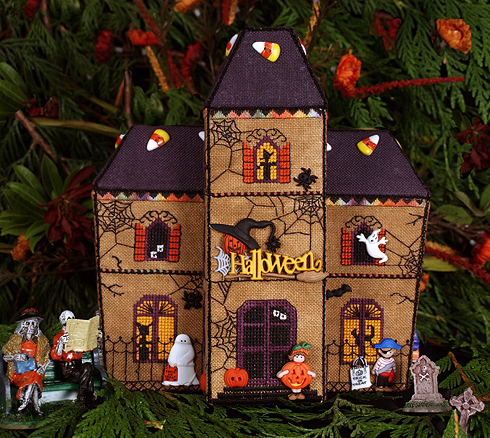 Except maybe not the ‘cuckoo’ of the Halloween house…….. What do you think? 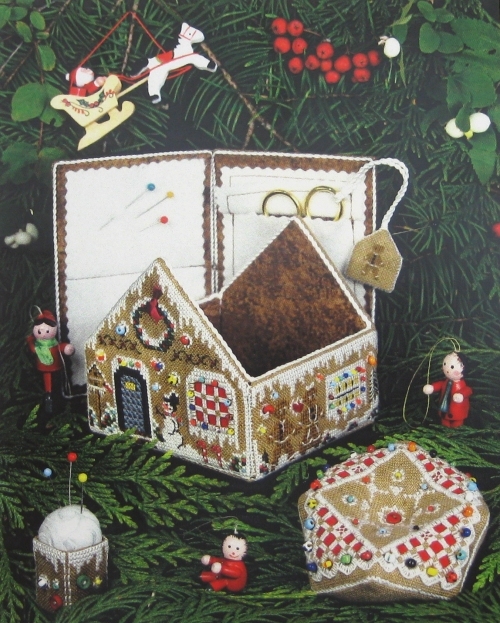 My fabric has arrived now for the three Gingerbread Village buildings that I am going to make – all from Victoria Sampler. The Victoria sampler website has suggested fabric layouts for each of the chart packs, so I printed those out, worked out how much I’d need altogether, and ordered the 28 count Cashel linen from Sew and So. I chose to have ‘Cognac’ shade, as the ‘Antique Almond’ shade suggested in the chart booklets is no longer available from Zweigart. I did wonder if ‘Cognac’ might be too dark a shade, but when it arrived I was really pleased with it. 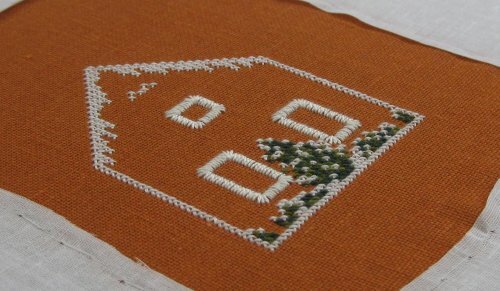 Maybe in Canada their ‘real’ gingerbread (the edible type) is made paler than the English type, but I would expect gingerbread to be quite dark in colour, so the fabric I have chosen is ideal for an *English* gingerbread village! 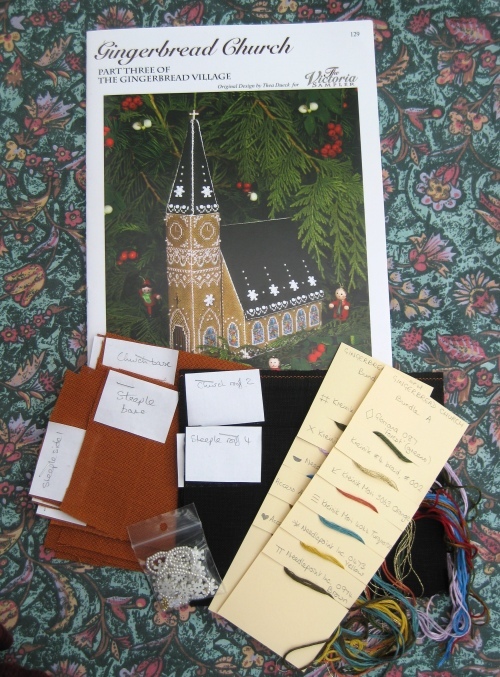 I have checked the shades of thread supplied in the Accessory Packs with the fabric I’m going to use, and nothing looks like it won’t work with the new fabric, so hopefully it will all go together well. 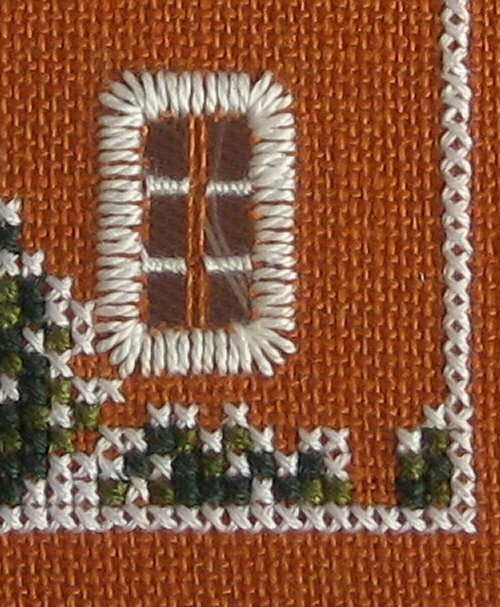 The suggested fabric layouts said to tack the outline of each side or roof piece of each building on one piece of fabric in a long strip, and then attach the large piece of fabric in one go to a roller frame, then do all the stitching, before cutting the pieces apart at the end. I prefer to tack each small panel individually to a piece of cotton fabric, cut away the cotton from the back to reveal the linen, and then mount the cotton in a hoop, as I feel this gives me better access to do the stitching when I rest the hoop on my floor frame. 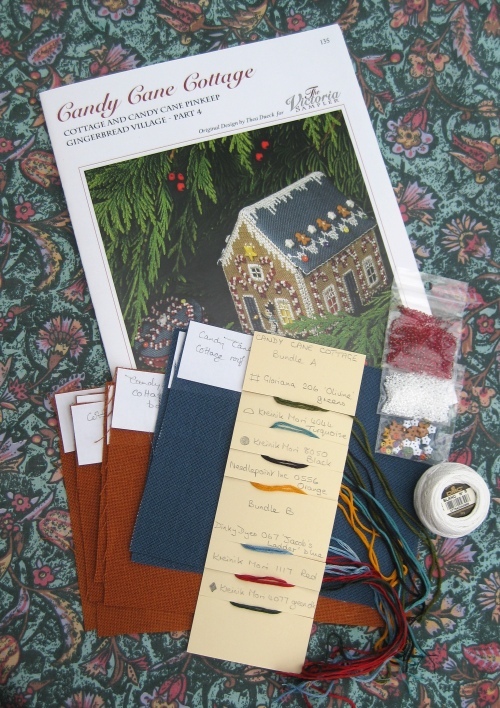 So, I spent about an hour cutting up all my fabrics (Cognac, black for the church roof, and a deep blue for the Candy Cane Cottage roof), labelling them, then bagging them up. I have made thread sorters for each of the packs, by making slits spaced 3/4 of an inch apart horizontally on a strip of card, and labelling above each pair of slits – the relevant threads can then be stored on the card, and not get mixed up. All I’ve got to do now is decide which one I’ll make first. These will take a while…. 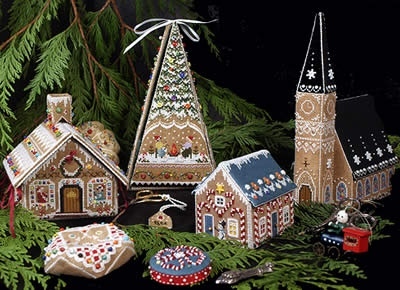 Just before Christmas, I blogged about the Gingerbread Village series of 3D buildings that Thea Dueck has created for her business, Victoria Sampler (in CANADA – I won’t get it wrong and claim she’s in the USA, this time 🙂 ). Back then, I was just drooling over the series of village buildings, and saying how good they looked, and that one day…. 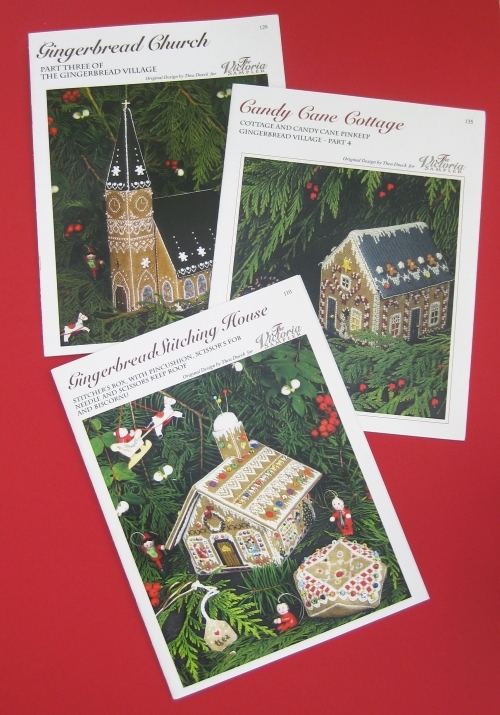 I gave in a few days ago, and ordered the chart booklets and accessory packs for the three buildings that are available so far – the Gingerbread Stitching House, the Gingerbread Church, and Candy Cane Cottage. Rather than order them direct from Victoria Sampler (and have to wait ages for them to get here because of Airmail, and pay huge shipping fees, and Customs Duty), I ordered them from Sew and So, and they came within two days, by courier, for just £1.99 p&p. That’s the kind of company I like buying from! 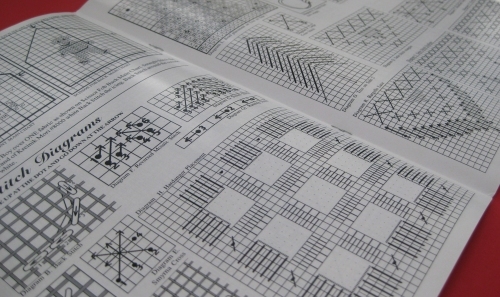 I have several of the Victoria Sampler chart booklets, and they’re always very well produced, using glossy paper, with large scale black and white symbol charts, detailed assembly instructions, and lots of photos. The spelling is sometimes a bit sloppy, but I can put up with that. It’s the designs that I love. 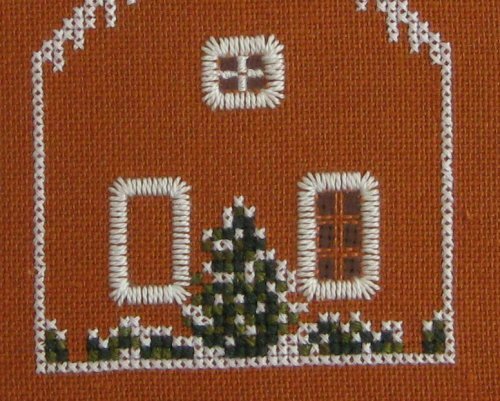 These are more than just cross stitch designs. They are part of what Thea calls her ‘Beyond Cross Stitch’ range, meaning that they are suitable for people who have done some cross stitch, and would like to move on a little with their stitching skills, using other counted thread stitches alongside the cross stitch. All the stitches are clearly explained. It just makes these lovely buildings even more interesting to make. The Stitching House is an etui – the roof lifts off, so that a biscornu can be stored inside, along with scissors on a fob. The underside of the roof has felt pages to store needles, and the chimney is a pincushion. The other two buildings are just models, which don’t ‘do’ anything (except look cute). The thing that attracts me the most with these projects, though, is the ‘accessory packs’, that are sold alongside the chart booklets. You don’t have to buy them, but they have such yummy things in them, that they are hard to resist. 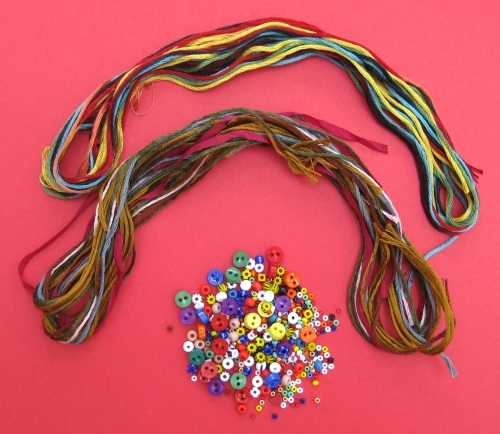 For these three projects, each pack has tiny seed beads (size 11’s as well as weeny little 15’s), cute buttons, gold charms, silk ribbon, and any threads that you need to complete each project – and these are high end threads, too, such as Gloriana and Needlepoint Inc. silk. 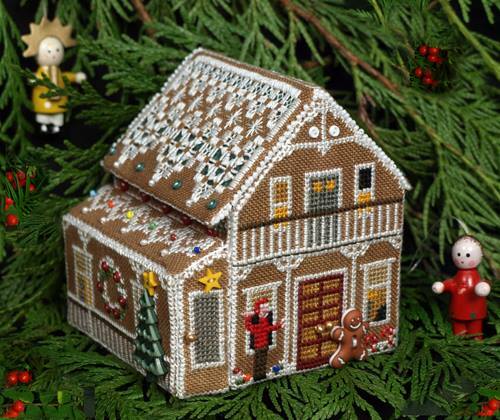 This is the accessory pack for the Gingerbread Stitching House – look at all those tiny little beads & buttons! Suggested fabrics are listed in the chart booklets, but, annoyingly, in the UK at least, the recommended ‘Antique Almond’ (a kind of medium brown) 28 count linen evenweave fabric has been discontinued by Zweigart. Sew and So say on their website that Zweigart’s ‘Dirty Linen’ shade is a ‘close match’ to use instead, but I’ve already got some of that, and I reckon it’s completely different! Much greyer, and very drab-looking. Not gingerbready at all. So, I’ve chosen to use Zweigart’s 28 count linen shade ‘Cognac’, which is a strong rust brown shade. I’ve ordered a metre of the stuff now (enough for all three buildings), so if it’s the wrong colour when I get it, I’ll have a lot of it to use up in other projects. I’ve got several things on the go at the moment, so these will have to wait a while, but I don’t think it’ll be long before I’ll start on them. 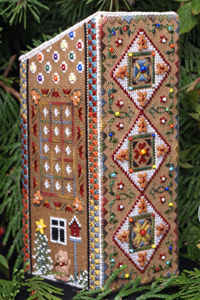 Author Janet GrangerPosted on March 14, 2013 March 13, 2013 Categories Gingerbread villageTags Candy Cane Cottage, Counted embroidery, Crafts, Cross stitch, Embroidery, Gingerbread house, Gingerbread village, Hand embroidery, Thea Dueck, Victoria sampler8 Comments on These will take a while….